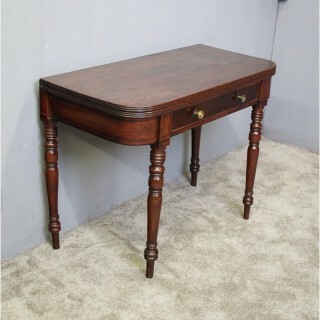 Circa 1820, George IV Scottish mahogany foldover tea table. With curved ends, reeded fore-edge and a full length drawer with ash lining and cast brass knob handles. There is ebony inlay to the top of the legs and sides, and the legs are ring turned, and taper down. The 2 hinged back legs swing out to support the top, finishing on turned feet.